Hi, I'm on the latest version of Sierra, when I go into Finder, double click on f.lux or right click to get menu then 'open', I can't get into the software's menu? I'd like to change the settings. How may I do this? @Richard101 Are you seeing an outline of the f.lux icon by your clock? Look for the flux process in the activity monitor on Mac. @Tungsten_smooth I'm thinking a re-install would be best. But It won't let me delete f.lux in Finder because 'it's open'? 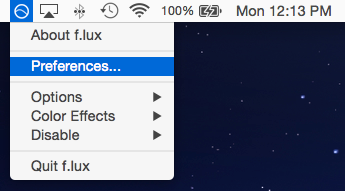 @Richard101 Stop the flux process and delete any folders / files for f.lux. Then reinstall. @Tungsten_smooth I managed to stop the f.lux processes using the Activity Monitor. Then I deleted the software. Then I re-installed but I still can't get in the menu. This must be an incompatibility issue with Sierra? If you're using an app with a lot of menu items (to the left) these icons can hide, but other than that I would expect it to be there! @herf It's now there. Not sure why I wasn't seeing it before. Thanks a lot to all!